Especially just before and right after halftime Genoa played very good and had big chances (Palacio twice and Chico) to open the score in San Siro. In the 49th minute a long ball of Pirlo behind the Genoa-defense was touched by Ibrahimovic inbetween Dainelli and Ranocchia who both were not agressive enough. Because also Eduardo was too far out of the goal Zlatan scored the undeserved openinggoal. During the rest of the match Genoa did everything to try to score the equalizer, which gave Milan the biggest chances in the contra-attack. Our goalkeeper Eduardo saved us several times, just as Criscito, but at the end we only got the compliments and not the points: Milan-Genoa 1-0. The same 22 players as in the selection against Fiorentina are with the playerscoach on the road towards Milano to play tomorrow at 18.00 hours in San Siro. With Milan play this year 3 ex-Genoani: Marco Amelia, Sokratis Papastathopoulos and Kevin Prince Boateng, who is still owned by Genoa and rented to Milan. Both teams have 5 points in the standings and draw 1-1 last Wednesday against Lazio and Fiorentina. The match is on Saturday because Milan plays Tuesday in Amsterdam against Ajax in Champions League. In this 4th match of the season we saw why Genoa was named as the “King of the tranfermarket” this summer. With the 5 new players Eduardo, Chico, Ranocchia, Veloso and Toni in the line-up Genoa played a fantastic match and deserved a victory against Fiorentina. Only goalkeeper Frey and a lots of luck brought Fiorentina a point in Luigi Ferraris. Also the goal of Forentina was lucky because Gilardino could never have scored if the cross did not hit the back of Mesto. Our midfielder had his revanche a few minutes later: a fantastic combination with Veloso brougth “Joey” Mesto already his second goal of the season: 1-1. In the rest of the match Genoa tried everything to score the deserved winning goal. Goalkeeper Frey and some luck kept the 1-1 draw on the scorebord after 90 minutes, but if Genoa keeps playing like this the victories are coming soon! After the unexpected defeat against Chievo there were a lot of rumours in the newspapers. Mr. Gasperini was blamed for his substitution of defender Ranocchia by midfieldplayer Kharja and also our president Mr. Preziosi was not so happy. He spend nearly €50 million this summer and was especially unhappy about the mentality of the players against Chievo. Because of all of this the team was a little under pressure against Parma. Just as against Chievo our Rossoblu played a fantastic first half an hour. Already in the 2nd minute defender Zaccardo of Parma got a yellow card because he could not stop our forwards regulary. In the 26th minute the same Zaccardo made a handball in the penalty-area and referee Rizzoli whistled for a penalty, but “forgot” to give Zaccardo his second yellow, so red card. Luca Toni realized the penalty and scored his first goal in the world’s most beautiful shirt. In the 2nd half Parma was the most dangerous team in the field, while Genoa played a lot better then last week. In the 71st minute Zaccardo (the man of the 2 yellow cards!) 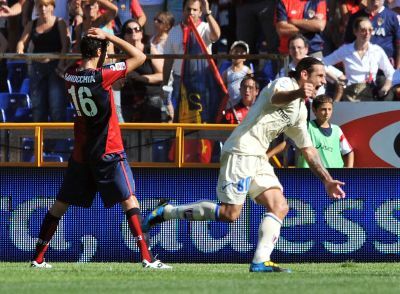 headed the equalizer behind Eduardo who saved Genoa with an incredible reaction a few minutes later. After all the draw was right, but what if Zaccardo got his deserved second yellow card in the 26th minute ?! 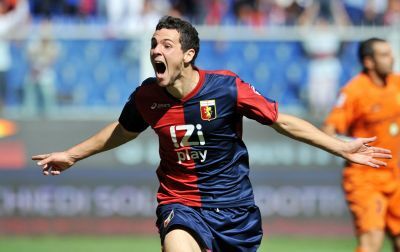 Despite the openinggoal of Mattia Destro in the 6th minute and half an hour of fantastic football, Genoa lost the first homematch of the season by 1-3 against Chievo Verona. In the 45th minute Moscardelli scored the equalizer with a lucky shot against the leg of Dainelli. After the teabreak there was only one team in the field: Chievo Verona, that scored another 2 times (Marcolini and Pellissier) and deserved the victory. After the great start in Udine a little deception to Mr. Gasperini and the team. Chievo Verona now is on top of the standings and the only team with 2 victories in Serie A.
Genoa misses the forwards: Jankovic, Palladino and Toni.